Fred Rogers was a legitimate American national treasure. Over 31 seasons he proved to be the reliable, compassionate and all-wise friendly neighbor who guided millions of youngsters through their childhood. Fred single-handedly introduced children’s educational television, in the process elevating a medium that was heading downhill fast. His radical kindness, typified by a gentle and personal manner, helped bring sanity to a world beset by problems. 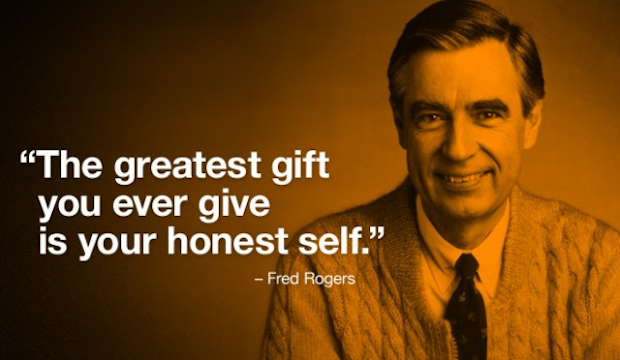 Having Mr. Rogers as our neighbor made the world a safer place. Frederick McFeely Rogers entered the world on march 28th, 1928 at his grandparents house in Latrobe, Pennsylvania. His parents, James and Nancy, were extremely pious people, so young Fred grew up in a very religious household. James worked at the McFeely brick company, which was owned by his father. He was a hard working, industrious man who taught these traits to his son. Nancy volunteered at the local hospital as a nurses’ aid. She had a deep love for helping others, which also was also a huge influence on Fred. In later years, Fred would fondly remember how his mother required everyone in the family to hand knit sweaters every Christmas for the troops during the war years. This family ritual instilled in Fred a love for sweaters, and they became his trademark during his TV show, Mr Rogers’ Neighborhood, in years to come. Every one of the hundreds of sweaters he wore on the show was hand knitted by Nancy. The extended Rogers family was very close, with Fred developing a special bond with his grandfather. The two spent many hours together, where the old man would encourage Fred to be himself, expressing all of his feeling and emotions freely. This had a great impact upon Fred, who fondly recalled how his grandpa had told him that he made his day special by simply being himself. Those words made Fred feel special, and he made it his mission in life to help other people feel the same way. When he was eleven, Fred’s parents adopted a baby girl named Elaine. Fred loved being an older brother, even though Elaine proved to be quite a handful. Away from the love and security of his family, however, Fred struggled. He found it difficult to make friends, often finding himself isolated and alone. The other children made fun of the fact that he was overweight and that he didn’t join in with their rough and tumble play. As a result he became quiet and shy. His parents told him to ignore the negative feelings that were welling up inside him and focus on positive things. This only made Fred feel more hurt and confused. In his later years one of his key messages to parents was that children’s feelings need to be acknowledged rather than ignored. The outlet that Fred finally stumbled upon to release his pent up emotions was the piano. When he was just a few years old, Nancy would play the piano to soothe Fred. By five, he was playing it himself. He was a natural and, within a few years was so proficient that he would play for guests and family members. His act would also include a puppet show. Fred found that these outlets allowed him to express his feelings in a way that wouldn’t upset other people. When he was ten, Fred’s grandmother bought him a piano of his own – a twenty five dollar pump organ. He spent hours each day practicing, with his time at the keys being the only periods that he felt like he was being his true self. In his early teens , Fred also became obsessed with photography, developing his own prints in a basement darkroom. His favorite thing to capture on film were the expressions on other people’s faces. The Rogers family attended the Presbyterian Church in LaTrobe. From the very start, Fred was eager and engaged. He was entranced by every sermon, finding a personal connection to the message of Christianity and the personality of Jesus Christ. It inspired in him the deep felt desire to serve and help other people. When Fred entered high school, he was just as shy and uncertain around his peers than ever. He did, however,develop a very unlikely friendship. Fred could never have imagined that he would become close friends with someone like Jim Stambaugh. Stambaugh was a popular and talented athlete and football player. When Jim suffered a football injury, however, he was confined to a hospital bed for a period of weeks. The school assigned Fred to deliver Jim’s homework to him in hospital, as well as making notes for him in class. Jim and Fred spent time together and come to appreciate each other. Fred could see through Jim’s exterior image as the sports hunk and Jim could appreciate Fred’s quiet, thoughtful nature. When Jim was released from hospital, the friendship continued. Through Jim’s influence, the other students came to realize that Fred wasn’t so bad after all. Fred hadn’t changed but now the other students let him be himself without harassing him. From this he learned a powerful lesson that he strived to impart to millions of children through his TV show decades later – be yourself without shame! As a result of his new found acceptance by his peers, Fred’s confidence grew in leaps and bounds. He became involved in school activities, becoming editor of the school yearbook and the school newspaper. By the end of his senior year, he was president of the student council. He came to be respected, rather than mocked, for his quiet, thoughtful nature. During his highschool years, Fred developed another relationship that was pivotal in his life. George Allen was an African-American friend of the family. As well as sharing Fred’s passion for music, George was also a passionate pilot. He shared his enthusiasm with Fred, teaching him to fly. While Fred never developed George’s passion for flying, he was entranced by Fred’s love of imparting his aeronautical knowledge. It was then that he learned what it was to be a true teacher. Upon graduation from high school, it was Fred’s intention to go to a seminary and become a minister. This seemed to be his natural calling, allowing him to serve others just as his parents had groomed him. Still, he felt a need to achieve a college degree and his love of learning inspired him to enroll at Dartmouth College for his freshman year. He decided to study the romance languages. After a year, however, he decided that what he really wanted to study was music. Dartmouth had no program that was worthy of Fred’s talents, so he transferred to Rollins College. It was during an initial tour of Rollins College that Fred ran into his future wife, Sara Joanne Byrd. Sara became hugely impressed with Fred’s piano playing ability and he quickly became a part of her circle of friends. Fred majored in music composition and minored in French language. Prior to graduation in the summer of 1951, Fred returned home on vacation. He still fully intended to attend a theological seminary after graduation. But everything changed when Fred saw his first television show. On the small screen Fred watched as two men threw pies into each other’s faces. In an instant he saw the potential in this new medium to educate millions of people at once. At the same time, he was appalled at the lowbrow way that it was currently being used. Fred was so passionate about his desire to change the way that television was being used that he decided on the spot to give up on his ideas to join the seminary and pursue a career in television. Upon graduating from Rollins, and with his music degree in hand, Fred applied to NBC Television in New York and asked if they had any positions available. He was hired by a producer named Charles Polacheck. Fred moved to New York, full of enthusiasm, only to find that his days were spent running minor errands. He experienced the worst in his colleagues, especially those in positions of power. In later years, Fred remembered how one of his bosses severely chastised him in public for forgetting to put sweetener in his coffee. He tried, mostly in vain, to bring a positive vibe to the office. Fred’s favorite NBC show was Opera Theater. The show collaborated with famous composers to put on operas that were shown across the nation via the tube. Fred worked his way up to becoming a floor manager on the show. He was in charge of timing the programs, making sure the cameras were ready, and letting the actors know when to stop and start. His attentive personality allowed him to shine in the role. Fred also became floor manager on a handful of other shows. He came to appreciate the wide variety of uses that television could be put to. One of the shows he worked on was The Gabby Hayes show. He watched and absorbed the lesson as Hayes spoke into the camera as if there was only one person on the other side of the screen. Ultimately though, Fred became frustrated. NBC wasn’t showing any interest in moving into the use of television as a medium of education. He decided to leave and pursue his passion to bring music and education to the masses, especially the children. In 1953, Fred and Sara, who he had married the previous June, heard of a new television station that was opening up in Pennsylvania. It was to be called WQED. They decided that should apply and Fred was offered a job as program manager. WQED was the first community television station in the United States. Fred saw it as the ideal opportunity to shape educational content. A month before WQED was scheduled to go live, the owners decided that a children’s program would be a valuable addition to the line-up. Fred and a young woman named Josie Carey, the station secretary, were tasked with coming up with something. The show they come up with was called The Children’s Corner. The Children’s Corner started out very simply. While Fred worked behind the scenes, Josie introduced free children’s educational films. On the night before the show aired, station director Dorothy Daniel gave Fred a small tiger puppet as a good luck charm. Fred quickly dubbed the puppet ‘Daniel’. Without telling anybody, Fred positioned himself behind the set backdrop, which was simply a painted sheet. As Josie began introducing the first episode live on air, he cut a slit in the sheet and ‘Daniel’ appeared on screen and began conversing with Josie. The puppet proved to be a hit with audiences and and puppets became a regular feature of the show. Fred was the puppeteer as well as organ player. In order to rush between the set and the organ he took to wearing his trademark white tennis shoes. The Children’s Corner became so successful that Fred and Josie became local personalities. The show even came to the attention of NBC, Fred’s former employer. When their head of religious programming went on a four week vacation, NBC invited Fred and Josie to fly to New York to appear live every Saturday morning. They returned to Pittsburgh for the Monday morning show. The NBC Saturday show now exposed Fred to a national audience. He began receiving hundreds of thousands of fan letters. The NBC executives quickly secured Fred and Josie as regulars. They also had larger more professional puppets made. NBC put pressure on Fred and Josie to quit WQED and go daily on their channel. But the pair would not relinquish their loyalty to the original channel and they continued to travel back and forth. Despite his grueling TV schedule, Fred continued to pursue his dream of achieving a theological degree. He attended the Pittsburgh Theological Seminary, and studied in the late hours, finally achieving his Masters in Divinity. The most influential course he took was a masters counselling course, during which he worked with children to see how they reacted to puppet interactions. He found that children reacted very differently with puppets than they would with realm people and would more easily open up and communicate to a puppet. Fred was ordained in 1962. His vocation was to work with children and families through the mass media, specifically television. Plans were put in action for a Fred hosted show for the Presbyterian church. But before it got off the ground, Fred received the call that would change his life. The call came from Fred Rainsbury, who was in charge of children’s programming in Canada. He wanted Fred to come to Canada and put on a 15 minute daily show specifically aimed at children and using puppets and his musical talent. In was a huge risk for Fred and Sara, who now had two young children. But it was everything that Fred had been working towards and so they bit the bullet and moved to Toronto. But, when he arrived, Fred was shocked to realize that Rainsbury wanted him to appear in front of the camera, rather than behind the scenes. Rainsbury had seen Fred work one on one with children and knew that he had a special gift to connect with them. Over the next 12 months, the two Freds developed the program’s concept, with Rogers finally agreeing to appear on screen. The show was to be called Misterrogers as one word. Rainsbury felt that this would make it less formal to children. The show was set up in a neighborhood with whimsical sets and puppets for Fred to interact with. A man named Ernie was brought in as the puppeteer. The show was a huge success in Canada. However, after the initial twelve month contract was up, Fred decided to move his family back to the United States to be closer to family. Moving back to Pittsburgh, Fred waited patiently until WQED had room in their schedule for another children’s educational program. 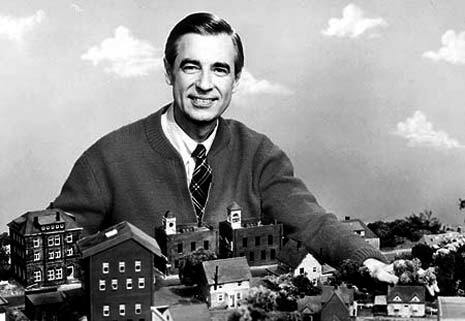 After two years, during which he held an education job with the church, the funding came through for Fred to host his own show on WQED, Mister Rogers’ Neighborhood. The show premiered in October, 1966. For the first year it was essentially a rehashing of the Canadian version of Mister rogers. 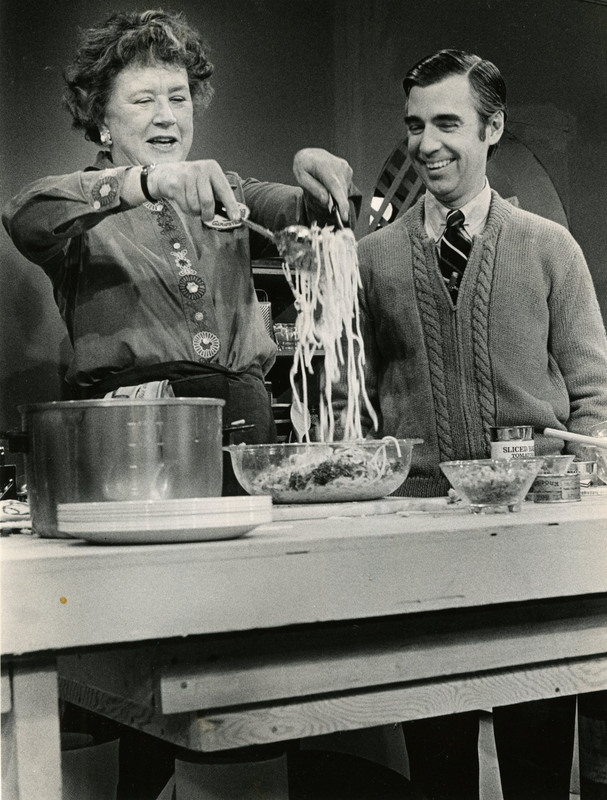 Within twelve months, however, the format had expanded and the show had been picked up by the Sears Company as a major sponsor, enabling it to go to a national audience. Fred wrote the theme song that was to become famous – Won’t You Be My Neighbor? The revamped show also added more characters, puppets and places to visit. Each episode Fred would go out of the studio and visit a new place. The second national series, in 1969, rolled out in full color. In the third season, the show, which had become hugely popular, was taken over by the Public Broadcasting Service or PBS. The first run of Mister Roger’s Neighborhood continued production for a total of eight seasons and four hundred and fifty five episodes. By then Fred was ready to take a break, and so the show transitioned to re-runs. But Fred was still busy. Ever the perfectionist he took the opportunity to fix up things that he didn’t like from older episodes. New original seasons of Mister Rogers’ Neighborhood began in 1979. Between then and 1993, fifteen new episodes were produced per season, with shows linking together and carrying through one overall theme for the season. The huge popularity of the show was due to Fred’s casual, inviting, empathetic nature. He never acted, always striving to be genuine and honest. His main method of teaching was through his own example, as many of his audience members grew up with him. The show would start with Fred talking directly to his child audience about a subject. Then it would transition to a field trip, which had been filmed earlier. Then it would be back live where Fred would move into the Neighborhood of Make Believe. This was a whimsical place where the characters could learn, explore and act out specific scenarios. Then Fred would move out of the Neighborhood of Make Believe and discuss what had happened in the neighborhood that day. From start to finish the emphasis of the show was on communication, opening up to others and exploring feelings. Fred was not afraid to discuss any topic that was relevant to children, including divorce and death. In addition to these ‘heavy topics’, Fred also encouraged children to have fun, exploring the world around them and keeping their curiosity alive. 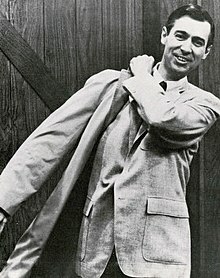 Fred (Mr.) Rogers on the set of ‘Mr. Rogers Neighborhood. In 2001, Fred retired at the age of 71, after thirty one seasons eight hundred and sixty five episodes of Mister Rogers Neighborhood. The show was officially over, but Mr Rogers was still a familiar TV personality through reruns. Although best known for his landmark TV show, Fred Rogers he invested his time and energy into other work as well. He was involved in the children’s book business, held seminars for parents and produced many documentary style features. The most well known of these was series called Mr Rogers Heroes and Old Friends, New Friends. For the show, Fred travelled all over the United States talking to admirable people. 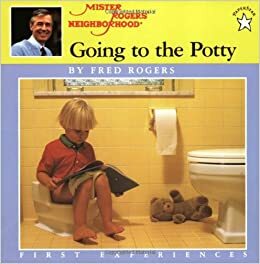 Fred authored a total of thirty six children’s books dealing with issues ranging from fear of going to the hospital to potty training. Fred’s passion for children’s education led to his involvement in advocacy work. In 1971 he founded a non-profit organization called Family Communications, Inc. He also made his voice heard on a national level when he became involved in government issues. In 1969 he appealed to a group of senators in an effort to stop the Federal government cutting funding to PBS. Largely as a result of his efforts, the funding was actually increased by ten million dollars. In 1984, he was called as an expert witness in a case between Sony and the Universal City Studio. The case was about the new Sony technology called Betamax, which was the forerunner of the video recorder. This new technology threatened Hollywood and Universal brought the case to stop Sony on the grounds of copyright. Fred testified on behalf of Sony, stating the importance of parents and children being able to tape his show for later watching together. Sony won the case. A year after his official retirement from television, Fred was diagnosed with stomach cancer. His last public appearance was when he tossed the coin at the 2003 Rose Bowl. A few weeks later he underwent surgery to get rid of the cancer. It was unsuccessful and Fred went home to spend his last weeks with his family. He died on February 27th, 2003, surrounded by his family and his devoted wife, Sara. Fred’s passing was mourned around the world. But it was felt the hardest in his native Pittsburgh, Pennsylvania. His memorial was held there and was attended by thousands of people,including many celebrities. PBS took steps to help children to come to terms with the loss of Mister Rogers. They continued to air reruns and a special entitled Fred Rogers: America’s favorite Neighbor was hosted by Michael Keaton. The greatest legacy of Fred Rogers is the show that made him a national treasure. The lessons he imparted – of tolerance, compassion, love and empathy – are just as relevant today as they were when Mister Rogers Neighborhood first went to air in the 1960’s.